From our annual company picnic at Green Lakes State Park. Founded in 1982, SCW is a progressive publisher committed to peace, sustainability, social justice, feminism and multiculturalism. We create and publish visual materials, like calendars, posters, T-shirts, cards and postcards, and distribute them across North America. We also distribute selected products, like books, music and DVDs, to complement our offerings. 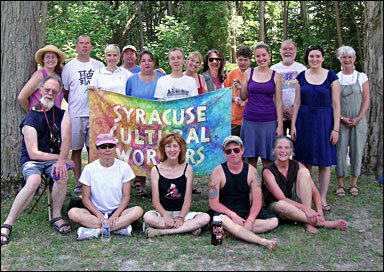 Syracuse Cultural Workers' mission is to nourish communities that honor diversity and creative expression, and inspire movements for justice, equality and liberation while respecting our Earth and all its beings. We see cultural work as an essential part of and support for political and economic change. 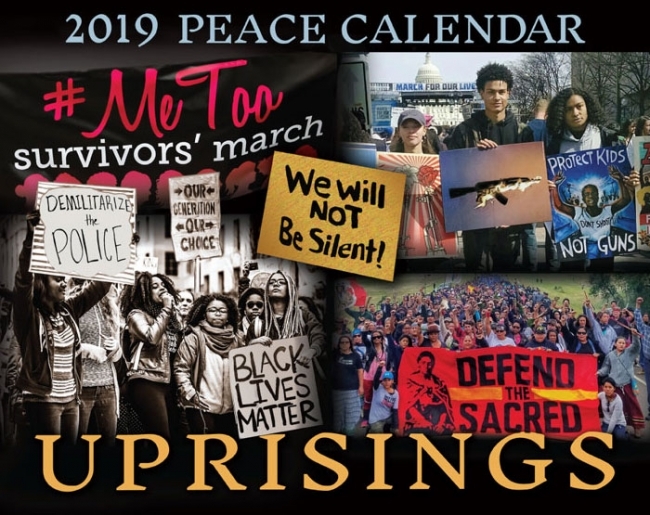 Many of our materials celebrate movements for social change and their leaders, thus helping to legitimize history that is largely ignored or trivialized by commercial media and school textbooks. SCW also helps to unite socially concerned artists with a growing audience hungry for meaningful artwork. Art is a critical complement to activism, lending soul to a function which is often brain heavy and spirit thin. No matter how brilliant our attempts to inform, it is our ability to inspire that will turn the tides. When we look for hope, we turn to works of socially responsible artists which address the richness, the sacredness and the crisis of the contemporary human family. We are inspired by work that relates matter to spirit, that transforms a chunk of honest reality into profound possibility by a change of tone or throw of light. Art created with a sense of integrity has a redemptive power, a healing power which helps us transcend the tragic particularities of our culture. We are responsible for creating a culture in our own image. Our work is not simply to expose the evils, display our disrespect for greed and violence, refuse to cooperate with a consumerist culture. We need to build a culture of change. We need political art that is visionary, visionary art that is political. This statement is from the 1979 Peace Calendar which opposed nuclear power and weapons. It was published by the Syracuse Peace Council, coordinated by myself. The statement holds up reasonably well after 30 years and, hopefully, answers a frequently asked question about SCW’s name. The term “cultural worker” may be new to some people. We use it to suggest several things. First, that the task of creating culture in a society is not the work of an elite, highly-paid few—which has become the case in our mass-market society; for example, if a restaurant needs a painting for its wall or a musician to entertain its customers, why not seek out the talents of local people rather than the highly-paid “notables that have made it..” Second, that people who create culture are legitimate workers who deserve to be recognized and valued for their work, not “patronized.” Third, that the process of creation is based in a desire to improve the lives of people not to just turn a profit. Fourth, that all of us, in some way, are capable of being cultural workers if we can only free ourselves from “I’m not talented” paralysis that elitism and competition produce in our capitalist society. Most of the wonderful cultural workers that SCW works with are struggling. They need and deserve all of our support.